Is This How Nick Fury Loses His Eye in Captain Marvel? Nick Fury may lose his eye in a much different way in Captain Marvel than he did in the comics. In the original comics, Fury lost his eye and gained his iconic eyepatch after a grenade blast during World War II led to the deterioration of his eye over time. In the Ultimate comics, he lost his eye in the Gulf War, which also takes place in the early 1990s. However, it looks like Marvel Studios is going to tweak his backstory in the upcoming Captain Marvel. 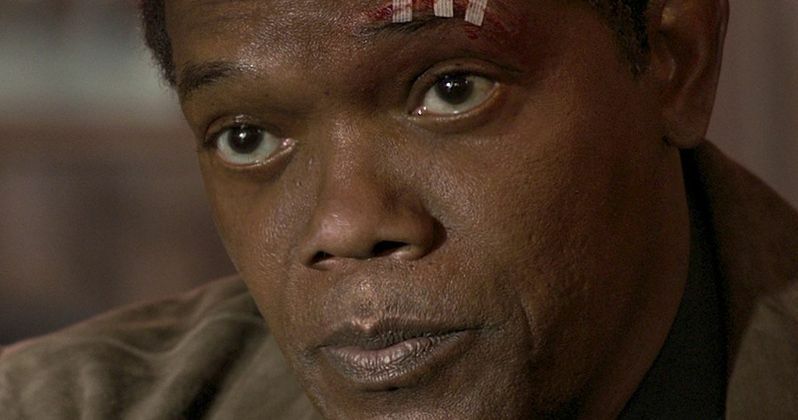 In the latest Captain Marvel trailer, Nick Fury can be seen with some small bandages above his eye, which means that he was attacked by someone, or something. Holding the key to this new theory pops up at the end of the trailer when Fury is meeting Carol Danvers' cat Goose for the first time, and getting all cute with the little cat. Like Fury's backstory, Goose's has changed too, including his name. In the comics, Goose's name is actually Chewie, meaning that Marvel Studios swapped out a Star Wars reference for a Top Gun reference. Goose is no ordinary cat. In the Captain Marvel comics, he is an alien Flerken, which is a pretty crazy creature that has massive tentacles underneath its cute cat exterior. Goose is fiercely loyal to Carol Danvers and it is extremely friendly to her. However, if it feels uncomfortable or threatened, it can become vicious, which may be why Fury could have gotten a warning, and then later losing his whole eye. Fury may have made Goose nervous, resulting in a very violent loss of his eye, or a warning scratch could get infected, also leading to the loss of his eye. Another clue adding evidence to this theory is found in the Hasbro action figures for Captain Marvel. The Carol Danvers figure comes with a cute and cuddly version of Goose, which looks like he's playing. The Nick Fury action figure also comes with a Goose mini figure as well, but the look is drastically different. Instead of being all cute, Goose has a muzzle on, and he has restraints on both sets of legs, which means that Goose and Fury don't always see eye to eye on certain matters. Marvel Studios has been on a roll with their promotional material this week, but Captain Marvel may finally show us the real reason that Nick Fury wears an eye patch in the Marvel Cinematic Universe. It will be different from the comics, but it also looks like it could end up being pretty funny as well. Or, at least as funny as losing an eyeball can really be. You can check out some of the evidence below and over at Marvel Studios to make up your own mind, but it certainly looks like Goose and Fury have a difficult relationship.